One of the coolest bits of news from Google I/O last week was the expansion of Smart Lock into password management. 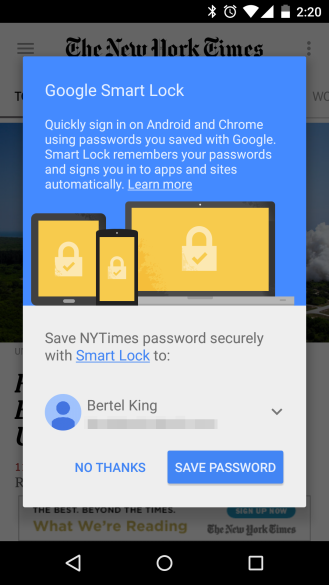 If your Google account has a saved password for a service, Smart Lock can automatically log you into an app. 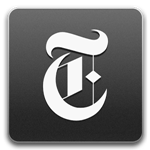 The newest addition to the list of supported apps is the official New York Times app. We knew this app was going to get support as it was mentioned on the Google Developers blog (Netflix already rolled out an update). However, the rollout just started a few days ago, and it seems like it's only now picking up steam. We've also got the APK if you're still only seeing the old version. Just for good measure, here's the changelog. Bug fix - Refresh issues with the article list widget have been fixed. Bug fix - Flickering issues in the widgets have been resolved. Visual enhancements and other bug fixes. When you log into the app, it will ask if you want to save the password with Smart Lock. From then on, all devices connected to your Google account will log in instantly. If you've already got your password saved in Chrome, the app should let you right in.